Sampling done from 1983 through 2003 shows where arsenic levels in groundwater are the highest in Michigan. Arsenic levels are in micrograms per liter. "You have to pick your poison, I guess. I think a lot of people in the Thumb who are aware of the arsenic problem have probably chosen to pick arsenic as their poison of choice." Dr. Michael Harbut is a professor of internal medicine at Wayne State University. He says he's diagnosed hundreds of people with signs of arsenic poisoning. "There are a lot of things that are not good for you, that's true," Harbut told us. "Temptation knows no boundaries on the number of things that are bad for you in the world. You have to pick and choose. You have to pick your poison, I guess. I think a lot of people in the Thumb who are aware of the arsenic problem have probably chosen to pick arsenic as their poison of choice." Information and bottles you would find for testing your well water in Washtenaw County. 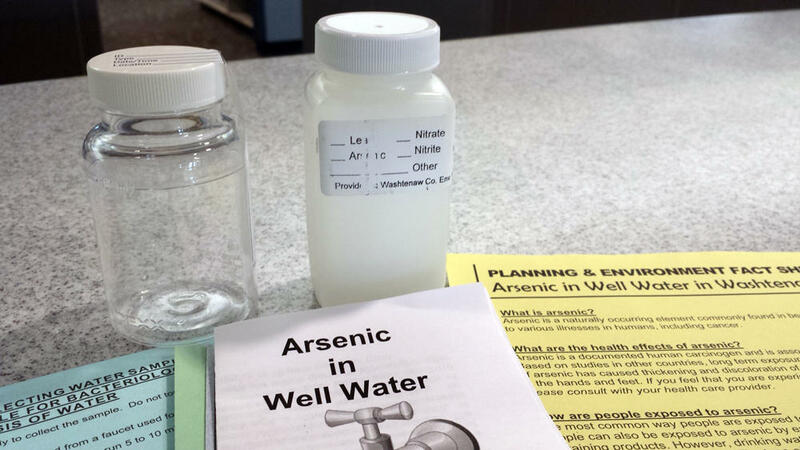 1) Contact your county health department and tell them you want to test your well for arsenic. They might recommend other water tests depending on your area. 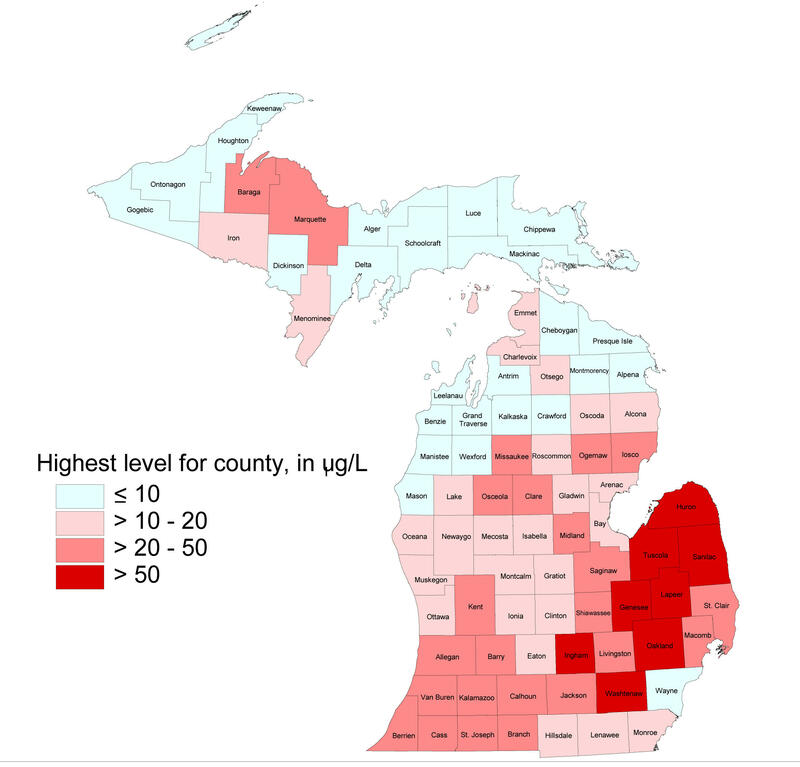 Remember, even though the map above shows where arsenic levels are the highest, arsenic can reach unhealthy levels anywhere in the state, so it's a good idea to get the test. 2) If you're having trouble reaching your county, you can always have your water tested by the state Drinking Water Laboratory. You can call them at this number (517) 335-8184. They will want to know what you want to test for. An arsenic test costs $18, and they will send you the testing kit. You can also get your water tested by any of these accredited labs. 3) The state recommends that you collect your water sample "at a time that reflects your typical household water use." Collecting a water sample right after a long vacation, for example, might give you higher results because the water hasn't been flowing for a long period of time. Do not rinse bottle with sample. Do not open the bottle until ready to collect the sample. Do not touch the inside of cap or bottle. Select a clean faucet and remove such attachments as aerators, dishwasher connectors, etc. Allow water to run for about ten minutes at full flow from the sampling tap. Reduce flow to avoid splashing, and collect the sample directly into the bottle. Do not use an intermediate container. Do not allow water from the outside surface of the faucet to drip into the bottle. Fill bottle to the bottom of neck. 4) Once you get the results, you might want to have another test or two done to confirm the results. The EPA's maximum contaminant level for arsenic is .010 mg/L. It can be expressed in different units, so .010 mg/L is the same as .010 parts per million (ppm), or 10 micrograms/liter (µg/l), or 10 parts per billion (ppb). OK, so I have arsenic in my water. What are the treatment options? If your results come in higher than the maximum contaminant level, you should stop drinking the water. Bottled water, treated with reverse osmosis, should be used instead. You can also have a reverse osmosis system installed in your house. Treating your entire house with a reverse osmosis system would be expensive, but you can install a small system in the sink where you get your drinking water. Those systems cost a few hundred dollars. Bathing, doing dishes, and doing your laundry in water with elevated arsenic levels is ok, according to the experts (unless your arsenic levels are seriously high - above 500 ppb - according to the Massachusetts Department of Environment Protection). Simple water filters, or a container with a water filter, won't take the arsenic out of your drinking water. Renee Thompson, one of the women who helped raise awareness about arsenic in drinking water in Michigan, suggests that you get in writing how effective the reverse osmosis system is with regard to arsenic. She says you can then have the system tested after it's installed. Remember, these systems require maintenance and filters will have to be changed to keep them functioning correctly. Continue to have the system tested periodically to make sure it's working.